Our research showed that the key perpetrators are male teachers, and male community members, and that traditional attitudes, a lack of formal education and poverty are the basic root causes of SRGBV. Objective one: To raise the profile of girls’ rights issues in the communities in and around Ndhiwa through the implementation of a mixed gender football skills programme in local primary schools. Objective two: To use the football programme as a means of reaching the wider community in order to challenge attitudes and make long -term changes in the ways girls and women are treated. Objective three: To provide support and guidance for girls who are vulnerable to and / or victims of gender-based violence. 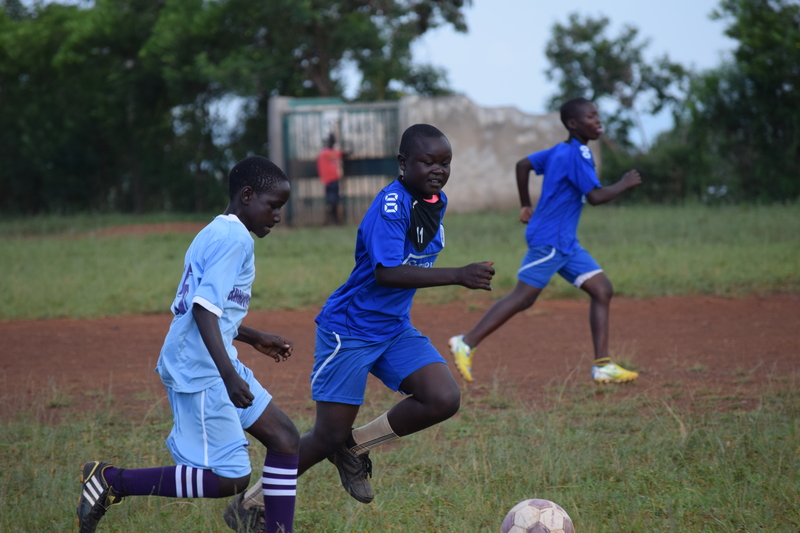 Girls who need individual help will be identified through the football programme and by their teachers. To reduce acts of violence it is crucial to address girls’ everyday relationships in their schools, families and communities. In 2017 we launched our Brighter Futures project including a mixed gender football programme to sensitise children and young people on issues around violence against women and girls, challenge attitudes and behaviour in the wider community, and identify girls that are in need of support. From 2017 – 2020 we will deliver this programme to over 3,500 children in 12 primary schools in Ndhiwa. We anticipate that we will reach a further 6,000 adults through our community workshops and over 600 girls will receive additional support through support groups and individual mentoring. Inter-school ‘fun day’ where 180 children played football and discussed issues surrounding SRGBV. Community events where stakeholders came together to learn about SRGBV and discuss the importance of gender equality. Recruited Girls’ Advocates in partner schools. The advocates will be a supportive and safe person in each school for girls to talk to and someone to monitor progress made on SRGBV issues in each school. Introduced a football team for the high-risk girls who have demonstrated real passion, skill and interest in football. “We as parents really appreciate the event, we wish to have more of the same to identify talents and moral behaviour engagement especially during holidays” – Kasuku Luse, Constituency Aids Coordinating Committee Coordinator. “The NCEDP/Team Kenya should expand the same to other schools in the entire constituency, thanks a lot for the programme”- Levis Chanyi, Police Officer Ndhiwa. “It was worth having this event, I only request that you incorporate / focus on having other like-minded organization to help you handle issues of GBV/SRGBV in wider society” Steve Ombiri Dreams Coordinator.